Recently, several types of high-speed vision in which the sampling rate is more than 1 kHz have been developed. In the high-speed vision system, not only sensing but also processing is achieved at high-speed, and it improves the performance of visual servoing. 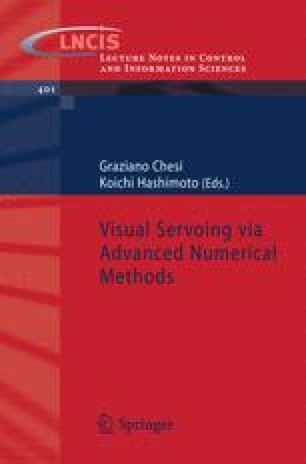 In this chapter, we described some examples of visual feedback control methods in our high-speed manipulation system. First, a hybrid trajectory generator using visual information is proposed for a batting task. In the method, the manipulator trajectory defined as a polynomial function of time is modified by visual information directly. Next, a visual servoing control with a passive joint problem is proposed for tool manipulation. Experimental results are shown.